I left my card with Rhiannon and as promised, a few days later she sent me over an email. I exchanged details and was thrilled when the postman delivered my goodies. I was expecting the sample size, so was over the moon when my full sized bottles turned up. The Keratin range is, "free from parabens, phosphates, dyes and gluten with 95% natural ingredients and infused with precious keratin". I needed something that would help with my dry and damaged hair, but would tame some of the frizz I sometimes get too. I use heat tools a lot and as we all know, its not good for our hair. Keratin helps to treat the targeted areas where there is damage and also controls frizz, which is just what I was looking for. 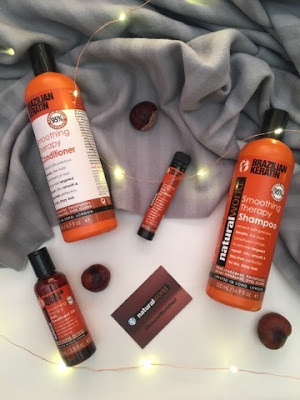 I've been using the Natural World range* for about two weeks now, so feel as though I can write honestly about how I've found it to be..
My hair is a lot smoother, manageable and less frizzy! I've found that when I use the hair treatment oil, I notice the biggest difference and it really does make styling it a lot easier. Not only that, but it smooths out my hair without it looking flat and adds a lovely shine. The only negative point I do have, is that I've noticed my hair gets greasy quicker. Rather than washing it every three days, I've had to go down to every two days. Not a huge difference, but it's something I've picked up on. For the sake of having healthier hair though, I shouldn't really be complaining. I'll definitely be picking up these products when I run out. They retail from around £3.49 and can be found in Tesco and online. If dry, damaged hair isn't you, why not have a look at the other hair types they target? 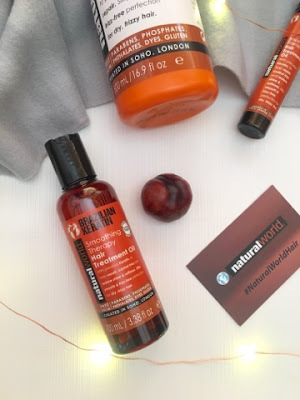 Have you ever tried Natural World's products? What's your hair type? I have frizzy long hair and I have been using lots of oils and treatments. The Natural World products are great, I tried the Keratin treatment and also the one with Argan oil, both did a great job. It takes some time to see results but if you stick to it, the results are great!